Travis CI is used by more and more open source Python projects to do their continous testing. scikit-learn is the latest project to adopt it. install: "pip install -r requirements.txt --use-mirrors"
There is however some dependencies where this is problematic. Two of those are numpy and scipy, which contain a lot of C code that, with the method just discussed, needs to be compiled every time you run the Travis tests. Travis allows you to install system packages through apt-get, which is quite cool. And there's already the binary python-numpy and python-scipy packages in Ubuntu, so why not use them? The problem is that simply installing them via apt-get does not work for the same reason it doesn't work when you do this locally: The default virtualenv that Travis sets up for you to run the tests in is isolated from the system packages, so it won't see those globally installed numpy and scipy packages. The solution for this is use virtualenv with the --system-site-packages option, which allows you to also import packages from the global site packages directory. A real-world use of this approach can be found in nolearn. Something terrible happened. My beloved python-mode for Emacs has been infested with featuritis, and it doesn't look like it's coming back. With Xubuntu and a few tweaks you can luckily ignore all the less fortunate decisions that Ubuntu has made recently. No Unity means no Dash means no broken privacy out of the box. So far so good. 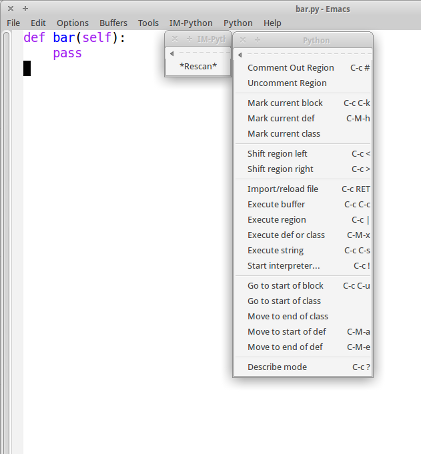 Then I installed Emacs and python-mode and started editing my first Python file. Which was when I fell into a deep shock. A few things felt just plain wrong. In fact so wrong that I was sure I had the wrong mode active (namely the other python.el, which ships with Emacs). For hours and hours I searched for a way to disable Emacs' own Python mode and enable the "good one", tried some hacks, but it wouldn't work. Because, really I was using the right mode all the time, but python-mode had changed so much I couldn't recognize it anymore. Firstly, the menu entries are completely different. 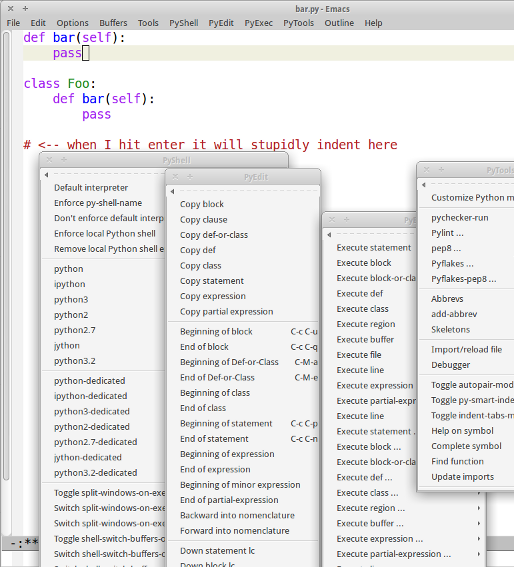 Instead of the two entries "IM-Python", and "Python" (which I hardly ever used), there's now five different menus called "PyShell", "PyEdit", "PyExec", "PyTools" and "Outline", each with a shitload of entries inside, with mostly either trivial things, or stuff I have no idea what they're good for. Take an example: The newer python-mode added skeletons. So that now instead of writing a for statement, you can now call up a macro that will ask you what to put into the name and expression parts of the statement, and then it'll write it. Yes, friends, imagine that instead of writing for foo in baz:, you can now call up this insanely useful macro and it will ask you to enter foo and then you hit enter and then it asks for baz, enter, and then it will write the line for foo in baz:. So what I did after I realized what was going on was to downgrade to python-mode 5.1, and finally my blood pressure went back to normal. I'd be interested to hear other people's experiences with python-mode 6, I wonder if I'm alone. Here's the two versions with their respective menus. Here's the videos and material for the Writing a Pyramid application tutorial that I gave at last month's EuroPython 2012. The tutorial is around 3,5 hours long. The accompanying material includes code and documentation for the seven individual steps of the tutorial (ex1_hello through ex7_final). Pyramid is a very general open source Python web framework. As a framework, its primary job is to make it easier for a developer to create an arbitrary web application. The type of application being created isn’t really important; it could be a spreadsheet, a corporate intranet, or a social networking platform. Pyramid is general enough that it can be used in a wide variety of circumstances. In this tutorial you will build from scratch a simple app in which users each have their individual workspaces, and can invite other users to collaboratively edit content. Work with the ZODB, a convenient database to store your Python objects in. The tutorial will be split into steps with each step accomplishing a certain set of goals. Documented code for all the individual steps, including the final application, will be made available to participants. Prerequisites: If you're on Mac OSX or Windows and you don't have Python 2.6 or Python 2.7 installed, you might want to run through the Pyramid installation instructions prior to the tutorial. We could also use some help in styling the search box and search results better. You can test drive the search on the demo site. 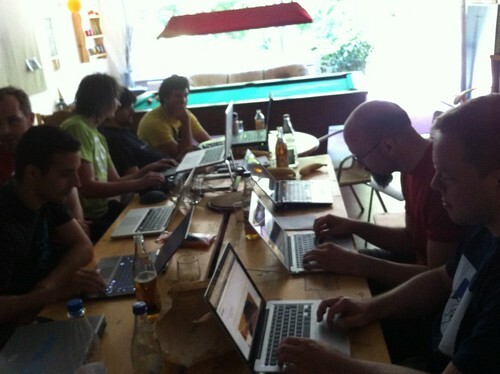 Christian, Florian, Krille and Ibi worked on adding support for what Wordpress calls Shortcodes and MoinMoin calls macros. With this, users will be able to insert codes like [gallery] into their pages and have these render to dynamic elements in the public view. Shortcodes may also take arguments like [table-of-contents level=3]. We discussed this idea back in February on the list. The team decided they would move the core functionality behind what they call snippets into a separate package pyramid_snippets. The idea is that snippets behave like views with the advantage that they can be easily pulled in via AJAX and be used in other places in the site, like in the portlet columns. The integration with Kotti is happening in the snippets branch. Plans are to add a button to TinyMCE that allows users to add snippets instead of having to remember the codes and syntax. We also want to eventually deprecate Kotti's slots and unify them with snippets so that slot renderers will become views and can be used as snippets and vice versa. Anreas (disko) added a new Image type and image scaling to Kotti core. He extracted these out of the nice kotti_imagegallery add-on that he had written earlier. Predefined image scales include span1 (60x120) to span12 (1160x2320). Additional image scales can be configured through the kotti.image_scales variables. Andreas (disko) and Daniel worked on improving the rich text editing story for Kotti. Based on the work done on images and scaling by Andreas, they created kotti_tinymce, which is an add-on that provides image and file upload, browsing and insertion through TinyMCE. One problem with kotti_tinymce is that there's no functional tests. We've just verified that things are working by clicking through all the dialogues manually. Considering that Products.TinyMCE is evolving separately and that we want to maintain upstream compatibility, we really want to implement some browser-based functional tests to be able to guarantee a reasonable level of stability. These tests will also help us fix the remaining bugs in kotti_tinymce. You can try out the rich text editing improvements on the demo site! Andreas (disko) and Daniel added HTTP caching into the Kotti core. There's now a default caching policy which may be overridden using the kotti.caching_policy_chooser setting. The default policy is to not cache HTML, cache media for four hours, cache static resources for a month and so on. The http caching code is based on code previously written by Daniel. Marco and Tom worked on kotti_paster which Marco initially started. They've been working on a set of accumulative templates for Kotti that are based around Buildout and try to define best practices for different aspects of Kotti and Pyramid development for beginners. This screencast guides you through the process of creating an add-on for the Kotti content management system. In this tutorial we'll write a simple commenting system in 21 minutes in real-time.